Who are Moscow's hipsters: A “creative” class of style-conscious young people in an endless search for the latest fashions, or just a not-too-sophisticated crowd with a blind worship of vogue, held captive by Instagram? It's not an easy question to answer. According to an elegant definition put forth by Yury Saprykin, if you can spot a hipster, it may be that “you are a hipster yourself.” Saprykin is the former editor-in-chief of Afisha – a magazine that had an inestimable influence on the formation of this social group. Hipster haunts are as versatile as hipsters themselves. They are constantly evolving: what was in style a couple of months ago is sadly “mainstream” today. Nevertheless, there are a few places in Moscow – sometimes even whole streets – that are continuously popular among hipsters. Last year, Moscow's first skatebowl was built in the Puma Social Club zone for skateboarders, rollers and BMX bikes, as well as a mini-drome for fixed-gear bicycles and a parkour zone. Even winters are fun here: half the park is turned into a skating rink with a huge, wooden, pedestrian bridge stretching across the entire area, complete with a Burton X snowboarding park and a ski slope added last year. Gorky Park also houses the Garage Center for Contemporary Culture in a pavilion designed by Japanese architect Shigeru Ban. Is pronouncing the word for a small Hawaiian guitar – “ukulele” – a walk in the park for you? Try saying the name of a Moscow shop where you can pick one from an array of African kalimbas and regular guitars: “Ukuleleshnaya.” If you fail, don't be too upset: even Muscovites can rarely make it on the first try. This is also the right place to go if you want to add a couple more vinyl records to your collection and have a nice time in a small cafe over a cup of tea, coffee or a smoothie. The legendary club Solyanka – originally the center of Moscow’s hipster crowd – matured as its audience grew up. The famous Nirvana spirit that has evolved into swag as of late is now the heart and soul of a small club nestled on two upper floors of one of the ARTPLAY cluster buildings. Last year it hosted an exhibition and a party to celebrate the second – and, so far, the last – issue of the Russian edition of the Vice arts magazine. One certainly gets the impression that DJs playing the hottest new music are all brought to Rodnya these days. Juke, trap, skweee and other music genres that unsophisticated listeners will hardly be able to distinguish between are featured here almost every night. The pedestrian area between Tverskaya and Bolshaya Dmitrovka looks like it has always been there. Innumerable sidewalk cafes almost block the street every summer. Back when hipsters were still dubbed “indies,” the whole crowd used to hang out in Prime; but once Starbucks opened its second outlet in Moscow just across from it, the hipsters relocated to a new place. This tends to happen a lot: every year, all Moscow fashionistas flock to a new place on the street as soon as it throws its doors open. This year portends new changes, with most of the Rozhdestvenka and Kuznetsky Most streets merged into a single pedestrian area with Kamergersky Pereulok. No image is complete without the right hairdo – and when Moscow finally went heritage and preppy, it became painfully obvious that the city lacked a barber's shop for a man to get a haircut, a shave or even a cup of good old coffee before rushing off to attend to his business. 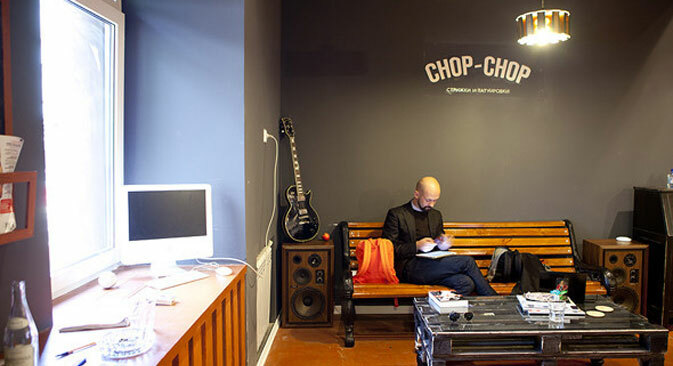 This is how the barbershop named Chop-Chop came into existence off Tverskaya Street. Recently, an equivalent, female-centric shop – Annie Hall – opened in Moscow, too. The founders moved to reach out to the regions, launching a Chop-Chop shop in St. Petersburg's Nevsky Prospekt, with Nizhny Novgorod next in line. A small bar hides under a vintage clothing store dedicated, as is appropriate of such stores, to Americana. With their girlfriends tagging along, a crowd of young men, both bearded and not, gather here in the evenings. Most of them look familiar, as if you have already seen them somewhere or have even been introduced. Muscovites like to compare Moscow to a “big village,” so the creation of such a secret, almost “friends and family” bar was only a matter of time. There is a network of small cafes around Patriarch's Ponds in Moscow, led by I Love Cake (4 Bolshoi Patriarshy Pereulok, which is proudly dubbed an “American dessert lab.” The other two outlets are Friends Forever (18 Bolshoi Kozikhinsky Pereulok) and Conversation (23/14/9 Bolshaya Nikitskaya). It is a general belief that a Moscow hipster equals a typical St. Petersburger with an extra touch of glamour. Even the Look at Me website – the crucible of Russian hip – was created by Vasily Esmanov. The common joke is that Esmanov, as a true St. Petersburger, works and lives in Moscow. All successful projects launched in Russia's former imperial capital have tapped into the Moscow market – including cafe Schastye ('Happiness', 16 Chistoprudny Bulvar). Opened on Myasnitskaya Street right at the dawn of the ongoing dessert revolution, the cafe is known for the best cheesecakes in town.